Google Inc has changed the search method to better understand, evaluate and process more complex, longer queries that come from Internet users. 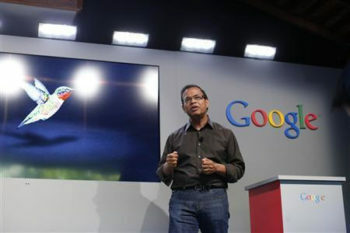 Amit Singhal, The senior vice president of search department – Amit Singhai- informed the reporters on Thursday that Google has launched the new “Hummingird” searching algorithm over a month ago. By doing so it has affected more than 90% of all searches that were conducted via Google search engine. The goal of the company is to be in the right place at the right time with the constantly changing Internet usage. Internet queries are getting longer and complicated, that is why the old “Boolean” or other search related algorithm systems failed to keep up with the needs of modern Internet users, because of the necessity to match keywords and meanings. Over the next 15 years the world has changed drastically, billions of users has joined the Web – Internet has grown and developed exponentially. It is possible to ask any question and get a response in a split second you’re your handy little gadget from your pocket. The company has changed over the last 15 years tremendously: growing from a small privately held company established by Page and Brin back in 1998 to Multinational corporation that specializes in internet-related services and products.